One of the ways to keep the body healthy is to keep it safe from diseases, make it fit and ensure it functioning normally whereas all these you can get when you eat fruits. The importance or benefit of fruits to the body is so much that we only need to be brief to make sure you cultivate the habit of eating it daily. 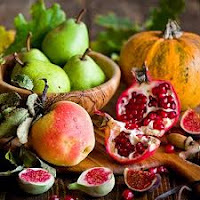 Fruits contains vitamins and minerals which helps the body in one way or the other while most of these fruits helps fight diseases, increases metabolism, repairs worn-out tissues etc. Some of these fruits includes mango, garden egg, watermelon, oranges, strawberry, apple, cucumber, lettuce, tangerine, lemon, grapes and many more. 1. Digestion: Almost all the fruits are very good for digestion. Many of these fruits when taken before or after meal contains some enzymes that fastens the process of breakdown of food in the stomach. Foods like tangerine, oranges, watermelon etc are very good for digestion. 3. Fight Diseases: Fruits generally are disease fighters because they contains enzymes that fight diseases in the body. Most fruits repairs worn - out tissues in the body. For instance, oranges contains Vitamin-c that prevents scurvy. 5. Reduce Sugar: Some fruits especially the unripe fruits of pawpaw, garlic, ginger,all prevents accumulation of excess sugar in the body which may lead to diabetes. When you eat fruits, you stand a chance of not having excess sugar in the body. 6. Increase Appetite: Whenever i don't feel like eating or if i lost appetite for food, just try as much as possible to eat fruits like watermelon, oranges, garden egg etc It will empty your bowels and gives you choice of food because these fruits ensures you go empty and hungry. 7. Dehydration: Many fruits are good at removing excess water from the body. Fruits like pineapples, watermelon, oranges ensures frequent urination which means they help clear the stomach and send excess water out of the body through the excretory organs. 8. Adult health: Some fruits like apple, watermelon, banana, etc are very good for adults. Many of these fruits contains vitamin -E which is essential for fertility in men or women. 9. Reduce Cholesterol: Most fruits like banana, watermelon, oranges, garden egg, apple, strawberry etc all contains fiber which help reduce the fatty contents in the body and when fats are reduced in the body, the body experience low cholesterol. Based on what you have read so far, it will do you lot of good if you eat fruits either before meal or after meal because of its health advantages. Fruits is good to the body and the cheapest way to maintain it is to eat some fruits. Check around and you will see lot of them at cheap prices. Thanks for reading.